Sabarimala temple will open for the two-month ‘Mandala-Makaravilakku’ festival today, 15th November 2013. Festival poojas would start from November 16th, the first day of the ‘Vrischikam’ month of the Malayalam calendar, after the new head priest of the temple P N Narayanan Namboothri opens the sanctum sanctorum early in the morning. The most important temple ritual the ‘ghee abhishekam’ would start from that day. The 42-day mandala festival would come to end on December 26 with the Mandala pooja. 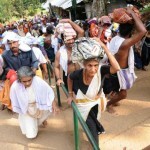 After a three-day recess, the temple would reopen on December 30 for Makaravilakku festival. The ‘Makaravilakku’ falls on January 14.